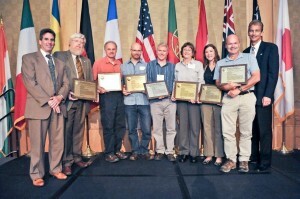 Members of working group accepting the Environmental Excellence Award at the 2011 ICOET conference. Formed in 2007 under the co-leadership of Washington Department of Transportation and Washington Department of Fish and Wildlife, the Washington Wildlife Habitat Connectivity Working Group is a science-based partnership that is composed of participants representing land and natural resource management agencies, organizations, tribes, and universities. Participants are defined as organizations and/or individuals that engage in the development of any of our analyses within the Washington Connected Landscapes Project. This engagement includes receiving regular emails on the process, attendance at meetings to develop our product, engagement in a subgroup or review, and/or contribution of knowledge to the effort. The full working group led by Core Team of individuals from public and private organizations that have been responsible for the overall preparation, interpretation, and coordination of products and oversee the current workload of the working group. 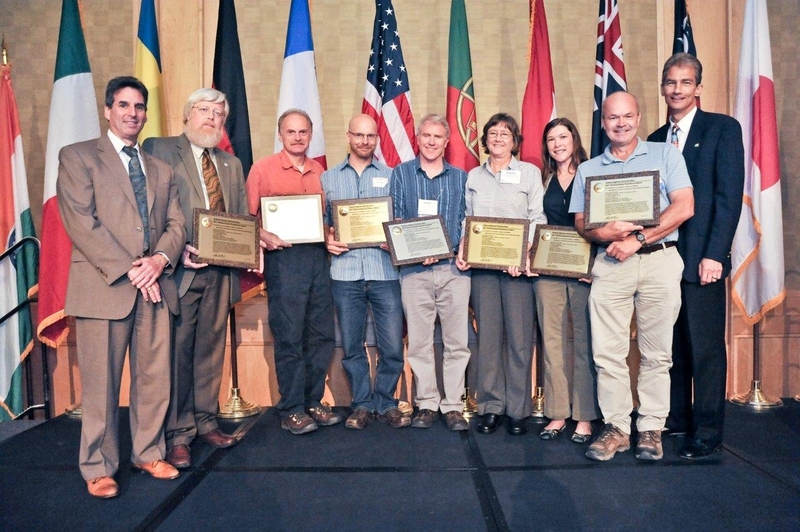 The Core Team currently consists of Bill Gaines (Washington Conservation Science Institute), Meade Krosby (University of Washington), Robert Long (Woodland Park Zoo), Kelly McAllister (Washington Department of Transportation), Tom Miewald (US Fish and Wildlife Service), Andrew Shirk (University of Washington), Peter Singleton (US Forest Service – PNW Research Lab), Mark Teske (Washington Department of Fish and Wildlife), and Jen Watkins (Conservation Northwest). The working group has an open structure and seeks to include all people and organizations that wish to assist in supporting the organization’s mission and therefore the participant list is expected to grow as our effort furthers. The Full Working Group encompasses all participants and includes talents in science, communications, and implementation. Most of the efforts currently underway in the working group are by specific regions or topics that function as teams within the larger working group. The Core Team aims to keep the larger working group connected through an annual meeting and this website. If you are interested in participating please contact us. Organizations that are or have been represented by individuals in the full working group participating in one or more product reviews, meetings, updates, subgroups, and/or other levels of engagement are recognized in the individual reports throughout this website. They include: Arid Lands Initiative, BC Parks, Bureau of Land Management, Bureau of Reclamation, Colville Confederated Tribes, Conservation Northwest, Conservation Science Institute, Defenders of Wildlife, Gifford Pinchot Task Force, Hells Canyon Preservation Council, Herrera Consulting, Idaho Dept. of Fish and Game, Ministry of Environment, Ministry of Forests, Lands, and Natural Resources, Okanagan Nation Alliance, Oregon Dept. of Fish and Wildlife, SC Wildlands, Shoalwater Bay Indian Tribe, Sierra Club, South Okanagan Similkameen Conservation Program, The Nature Conservancy, The Orianne Society, The Wilderness Society, University of WA, US Fish and Wildlife, US Forest Service, Washington Biodiversity Council, Washington Conservation Science Institute, Washington Dept. of Fish and Wildlife, Washington Dept. of Natural Resources, Washington Dept. of Transportation, Washington State Parks, Western Environmental Law Center, Western Transportation Institute, Yakama Nation. As our work continues, we anticipate this list changing and growing. Scientific review is provided to the working group through solicited peer reviewers, and species experts. The working group closely coordinates with representatives from related efforts to our analysis.